I’m going to have to have the most gigantic garage sale this summer when we move into our new house. I can’t tell you how many things I’ve bought or made to replace that very same or similar item that’s in storage. We even have two trampolines! (The kids have big plans for them both…we’ll see.) It holds true for holiday decor, too, but with one major difference–I don’t believe in having too much! I recently came across the most fabulous red and white striped pitcher, and being enormously obsessed with both red and stripes, I felt as if it was fate. The best part? It was only $10! It was a good day. I had packed it away for next Christmas, but then I realized how perfect it would be for Valentine’s Day. 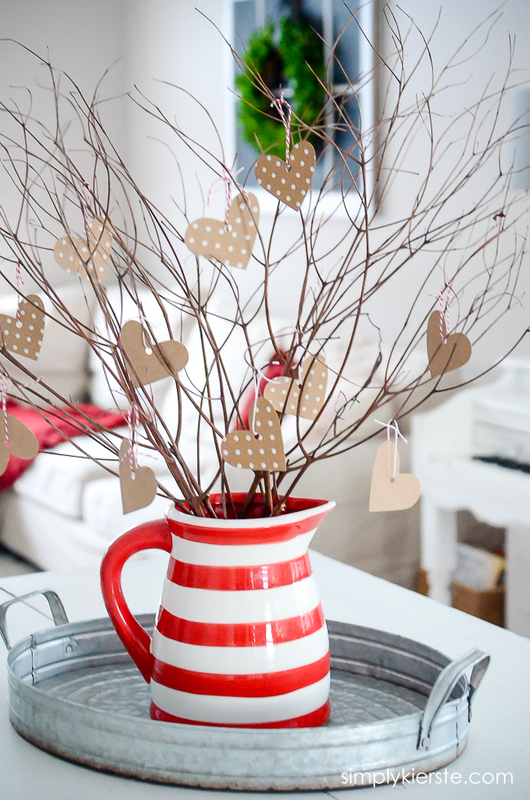 With a little card stock, twine, and a few branches, an adorable Valentine Tree was born! It’s the perfect centerpiece for my table, but I know it would look super cute on a mantel, entry or buffet table, or kitchen counter. Wouldn’t these be cute as party centerpieces? Or even wedding centerpieces? Guests could write little messages to the bride and groom on the hearts! 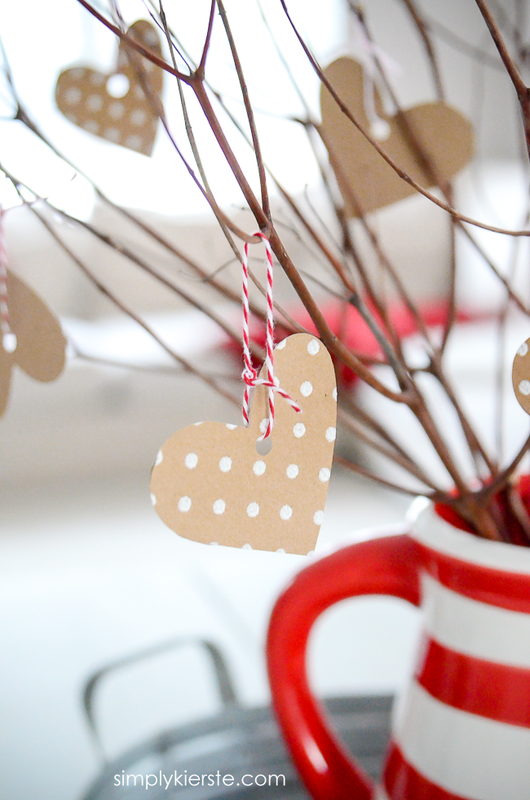 You can use the hearts on your tree as decor, or leave an extra pile of hearts around the pitcher (with the twine already on it) for the people in your family to write little notes to each other and hang on the tree. It would be a really cute countdown, or just as part of the Valentine month. The branches came from my backyard, and this is the perfect time to find them, because everything is bare. 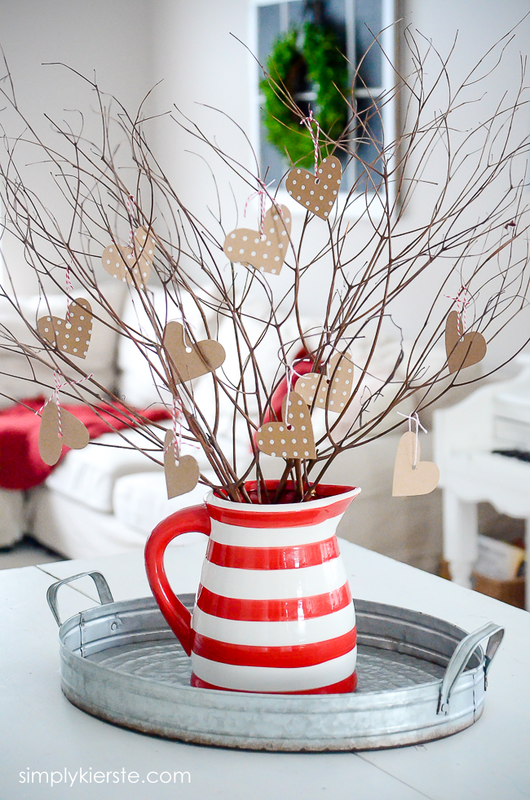 I used my Silhouette to cut out 2.5 inch hearts out of super cute polka dot paper (but you can totally cut out your own), punched holes in them, and tied them on the tree with baker’s twine. That’s it!! LOVE! 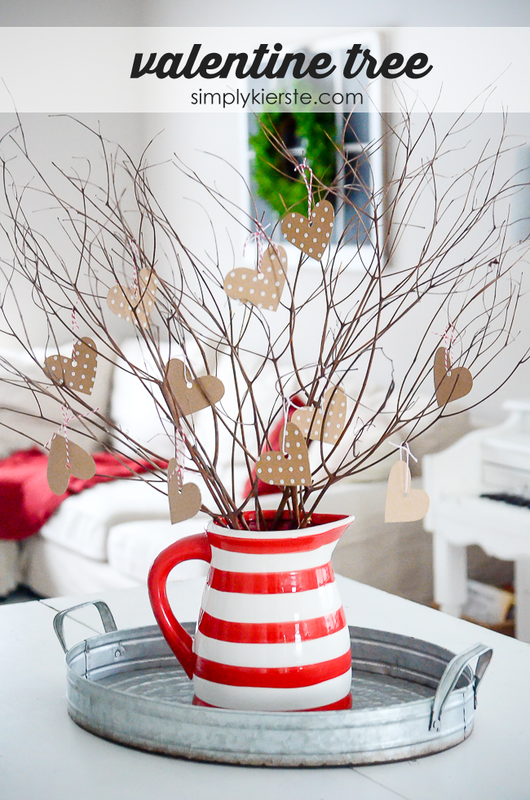 If you decide to use a white pitcher, you could add colored hearts instead–red, pink, striped, polka dot–and even in different shapes if you want to. This is one of those projects that can easily be changed up to fit what you have on hand, and whatever you need it for. This is super cute and I actually have that scrapbook paper!! So this is a definitely a quick project for me that I can do right away! Hi! What sized pitcher is this? I saw one for 22 ounces and one for 124 ounces! Thanks in advance!! It’s a pretty good size–I can’t go measure it right now (just had surgery and can’t get out of bed), but it’s definitely not the 22 ounce pitcher. It’s on the larger side! I found it at Home Goods a couple of years ago!